Fasten your seat belts and get ready for a joy-ride as the duo - Akshay Kumar and director Priyadarshan are back with yet another supposedly rib-tickling comedy - 'Khatta Meetha'. The duo, in collaboration, has created laughathons like Hera Pheri, Phir Hera Pheri, Bhool Bhulaiyaa, Bhagam Bhag and De Dana Dan. 'Khatta Meetha', which is releasing on 23rd July, 2010 is a satirical comedy film that revolves around a road construction contractor, played by Akshay Kumar. Trisha Krishnan, who makes her Bollywood debut after seven years with Tamil and Telugu cinema, plays his love interest. The film also stars the comedy kings- Asrani and Johnny Lever. What may appeal to the audience is the script of the film, which is based on real-life situations and thus the audience may closely relate to it. Will 'Khatta Meetha' be able to tickle the funny bone of the audience? Will it cater to their taste and choice of comedy? Ganesha finds out with the help of Vedic Astrology. As Mars is exactly on the Ascendant and as Ascendant Lord Mercury is in a fast moving planet i.e. 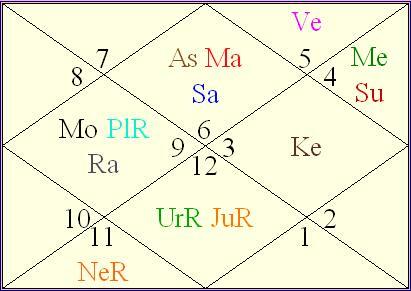 Moon's sign in the 11th House of gains, the film may have good start, feels Ganesha. Although Mercury is in the sign ruled by Moon, which is an unfavourable factor technically, atleast the movable nature of the sign will help this film attract the audience. Ketu in the 10th House is not favourable for the film and Retrograde Uranus with Retrograde. Jupiter in the 7th House indicates that the movie will face a tough competition at the box office. Khatta Meetha will attract the youngsters as Mercury is in the 11th House with Sun. This film is likely to do good business overseas. In India, first two weeks would be very smooth for this film, but the business may go down later. Opening would be around 70% across India and audience may have to face the 'Houseful' sign boards in some territories - especially in western and northern belt. May the film bring sweet memories to the cast & crew of 'Khatta Meetha'. Ganesha blesses the team.